The command for "copy" in the menu when you left-click on the From address is in ui/standard_menu.ini in the program files folder under the "[Mail Address Popup Menu]" section (or "[Mail Contact Popup Menu]" if the address is in your contacts). The command is just "copy", which copies the whole thing. There is a Copy link mail address command that's used for mailto links on web pages that copies just the you@example.com part I think, but it doesn't seem to work in that header menu. I'll see if I can find something that works either in that menu or outside of that menu on the toolbar. I'll let you know. I was mistaken. That command copies the whole mailto: link. The other command, copy email address always copies the whole thing including the name etc. just like copy does. So, there's no solution short of using copy + launching a program that fixes the value in the clipboard. To [Mail Address Popup Menu] and [Mail Contact Popup Menu] and it'll do what you want. "Alt + p -> advanced -> Shortcuts -> Opera Standard -> edit". There you can create a new shortcut. When typing in the command field on the right for a shortcut, the autocomplete will show you a list of available commands. Maybe you'll find one that works in the ini file. I thought there was one, but in my recent testing, I couldn't find one that does what you want. to copy just the address. I tried Copy link mail address. Couldn't get it to not crash Opera. Only place that it seems to work is on a mailto link on a web page (in Opera 12). 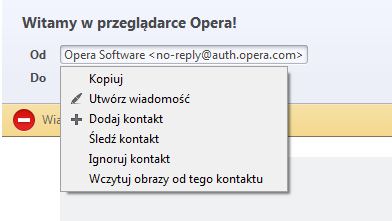 It's what's used in the mailto link context menu, but none of the options there copy just the address. I didn't see anything for nircmd either that can manipulate the clipboard's content. I guess for the other popup menu, one could use add contact and just cancel after the copy. That's not needed now with the last two commands I posted above. They'll work like you want whether the address is in contacts or not. As in, it should solve your problem.